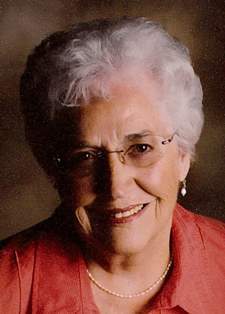 Obituary for Mrs. Janet L. (Miller) McCarthy | Hinchliff-Pearson-West, Inc.
Janet L. McCarthy, 86, of Galesburg, died at 9:25 p.m. Monday, April 8, 2019 in OSF St. Mary Medical Center. She was born June 15, 1932, in Galesburg, the daughter of Cecil “Dutch” and Clara (Nelson) Miller. She married Ronald J. McCarthy November 25, 1951, in Galesburg. He preceded her in death on October 2, 2002. She is survived by two daughters, Rhonda McGuire (Dave Ashton) of Galesburg and Roxana McCarthy (Ralph Steinheimer) of Sarasota, Florida; a granddaughter, Bailey McGuire (Andrew Luhovy) of Boston, Massachusetts; her sister, Sally Rednour of Galesburg, with whom she spent her time either together or on the phone; her special friend, Ralph “Red” Dolinsek of Galesburg; and many special nieces and nephews. In addition to her husband and parents, she was preceded in death by a son, Douglas McCarthy in 1970. Janet worked as an inspector at Maytag for 20 years before retiring in 1990. She was a lifelong Galesburg resident. Janet was a member of Grace Anglican Church. She and Ron enjoyed boot kicking, line dancing, traveling the world, and wintering in Sarasota for many years. Janet was an avid Chicago Cubs fan. She enjoyed crocheting and was a member of a sewing group. Cremation will be accorded. Visitation will be 1 to 2:30 p.m. Thursday, April 11, 2019 at Hinchliff-Pearson-West Funeral Directors and Cremation Services Galesburg Chapel. Memorial service will follow at 2:30 p.m. with Father Andy Ainley officiating. Private family burial will be in Memorial Park Cemetery. Everyone is invited to the Elks Lodge immediately following the service for a time of continued fellowship. Memorial contributions may be made to St. Jude Children’s Hospital or Knox County Humane Society. Online condolences may be made at www.h-p-w.com.